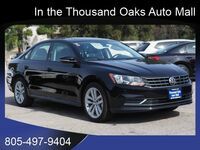 Drivers looking for a sedan with a punchy engine and superb ride quality without sacrificing storage space and interior technology will love the 2019 Volkswagen Passat in Thousand Oaks, CA. 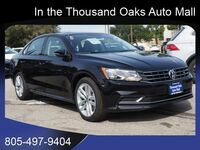 From safety to convenience, the 2019 Passat excels in several areas. Features such as a CD player, smartphone integration, a leather-wrapped steering wheel and heated front seats all come standard in every model. The many features available for previous Passat models have been packed into two trims for 2019: Wolfsburg Edition and SE R-Line. A turbocharged, four-cylinder, 2.0-liter engine which generates 174 horsepower and 184 pound-feet of torque is installed in both models. A six-speed automatic transmission system is paired with this engine on both trims. Smartphone integration services such as Apple CarPlay, Android Auto and MirrorLink are all available for 2019 Volkswagen Passat drivers with compatible devices. These services can be accessed via Volkswagen Car-Net App-Connect, which comes standard in both trims. Each of these services are displayed through a 6.3-inch touchscreen interface and allow drivers to utilize popular apps and mobile services. Other interior technology features include a USB port, an auxiliary audio jack, and a six-speaker sound system. 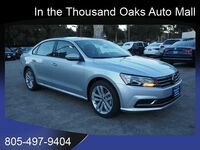 The 2019 Volkswagen Passat matches its abundance of entertainment and convenience features with an equally-impressive lineup of safety and driver assistance features. A forward collision warning system with automatic emergency braking, a blind-spot monitoring system and rear cross-traffic alerts are all featured in the base Wolfsburg Edition trim. Drivers looking for added safety should consider upgrading to the SE R-Line trim, which adds an upgraded blind-spot monitoring system, lane keeping assistance, front/rear parking sensors and adaptive cruise control. 2019 Volkswagen Passat exterior color options include: Platinum Gray Metallic, Fortana Red Metallic, Reflex Silver Metallic, Terra Brown Metallic, Tourmaline Blue Metallic, Deep Black Pearl and Pure White.